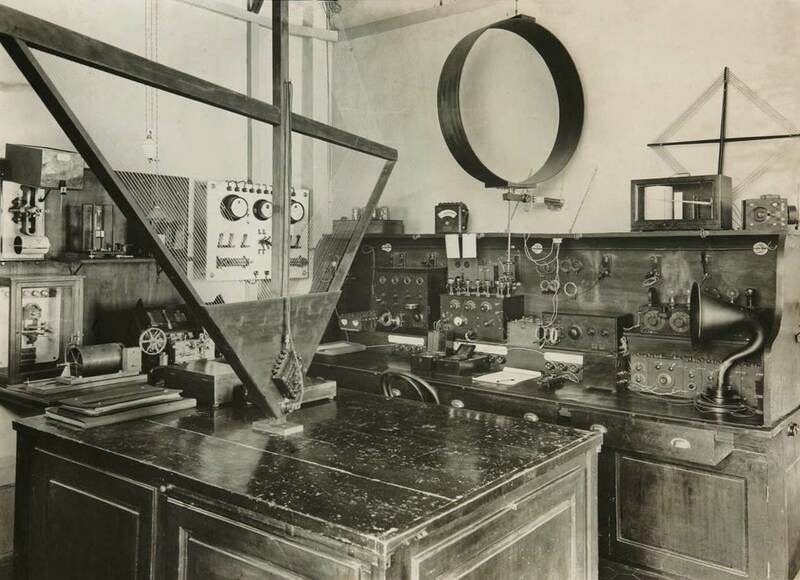 Marconi’s first experiment of signal transmission by means of Hertzian waves was carried out in 1895. In the following years, wireless telegraphy progressed steadily and worldwide efforts were made to exploit the potential offered by new technologies. In those years Guido Alfani, a young Florentine Piarist teacher of promise in Seismology, joined the Ximeniano Observatory in Florence where he found the ideal environment for his experiments and his insights. He understood the importance of having the exact time in Seismology, to temporally characterize the telluric movements and therefore accurately characterize them. In 1910 when the Paris radio station located at the Tour Eiffel began regular broadcasts of exact time, he laid down the issue of its reception. As far as pendulums and chronometers were concerned, no doubt his expertise as seismologist was significant, while problems arose when it came to the radio station, due to the novelty of such situation. For this reason he arranged contacts and managed to set the first Italian radio station to be used in a weather station. Thus, on the night of March 16-17, 1912, he received for the first time the time signal for a particular scientific application. He wrote to Marconi and in 1912 Marconi expressed words of great appreciation and encouragement for such work. Father Guido Alfani’s radio station is certainly the first one applied in Seismology and among the first radios made in Italy. It is an extremely important application which demonstrated that the new technique could provide solutions in different situations. Mario Calamia, former Full Professor at the School of Engineering of the Florence University, also taught at the Pisa University, at the Naval Academy of Leghorn and at the Delft University of Technology (NL). His research activity, carried out within Applied Electromagnetism, is extensive and well-documented. He was Italian Project Scientist of the SIR-C/X-SAR Missions, a joint program of ASI, NASA, DARA. In 2012 he was awarded the "H. Von Braun” of the German Space Agency. He was General Manager of the Italian Space Agency and Italian Delegate to the Space Advisory Group of the European Community. Recently he has been President of the Ximenes Observatory Foundation of Florence. Monica Gherardelli received her degree in Electronic Engineering in 1981 and a PhD in Information Engineering in 1987. From 1981 to 1991 she was researcher in polarimetric radars at the Electronic Engineering Department of the University of Florence. Since 1991 she has been Professor at the University of Aquila (I) and then with the University of Florence (I). Her research focuses on Remote Sensing, Digital Communications and Elaboration, Application of Digital Technologies to Cultural Heritage.